Documentation of existing flora of the urban environment is important to determine existing resources and to set target for future improvement. An understanding of the flora in regional level must play an important role in elucidating the larger patterns of distribution of biodiversity. Floristic inventory of trees of Andhra University campus in Visakhapatnam city was carried out during 2010 to 2016. This study resulted in record of 175 tree species pertains to 132 genera under 53 families. The data presented will be a valuable source of information for management of tree resources in the Andhra University campus. Fig. : A, Ailanthus excelsa Roxb. ; B, Anogeissus acuminata (Roxb. ex DC.) Guill. & Seneg. ; C, Artocarpus heterophyllus Lam. 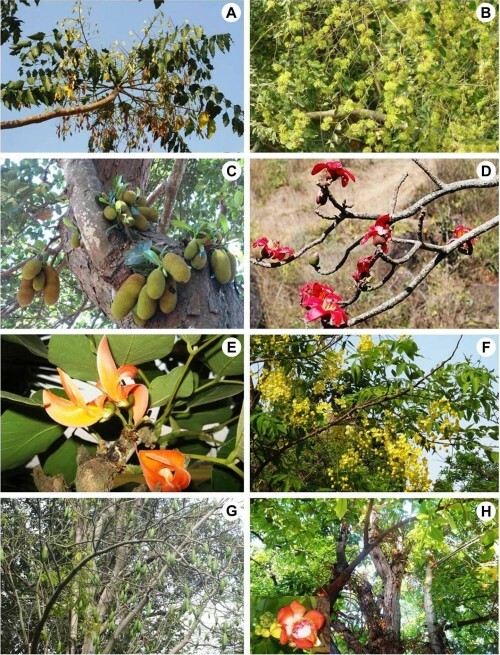 ; D, Bombax ceiba L.; E, Butea monosperma (Lam.) Taub. ; F, Cassia fistula L.; G, Ceiba pentandra (L.) Gaertn. ; H, Couroupita guinensis Aubl.